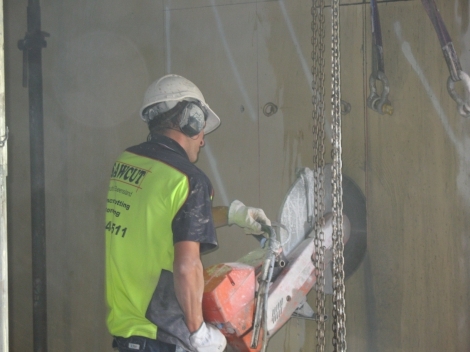 Hand sawing is mostly used in areas where a road saw cannot go. Hand sawing has a cutting depth of 150mm and can be used on floors and walls, if a deeper cut is required a Ring saw with 250mm depth can be used. Ring saw is used in conjunction with a hand saw to get a neat and deep cut, which is helpful in cutting out doorways and widows. Hand sawing is very efficient and portable system that can do jobs in small or tight areas, our trucks carry wet vacs for slurry collection if needed.